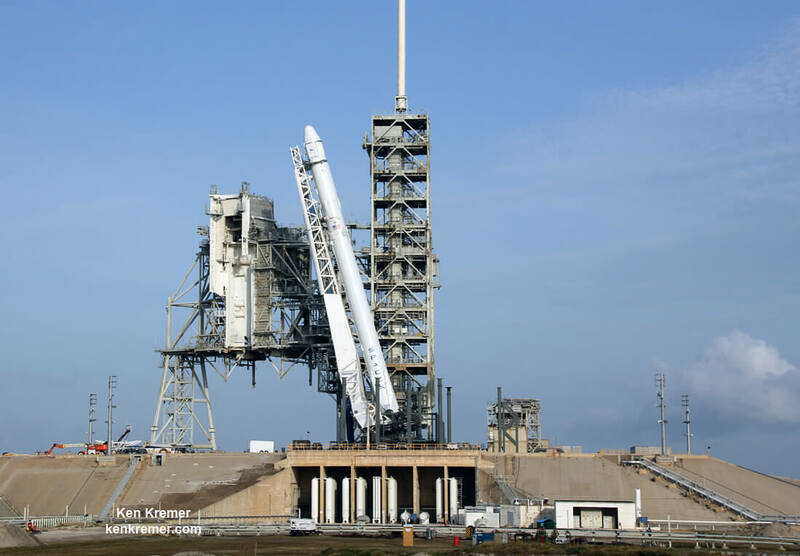 KENNEDY SPACE CENTER, FL – The first ever reused Dragon supply ship successfully arrived at the International Space Station (ISS) two days after a thunderous liftoff from NASA’s Kennedy Space Center atop a SpaceX Falcon 9 rocket on Saturday, June 3. The first stage booster made a magnificent return to the Cape and erect ground landing some 8 minutes after liftoff. Meanwhile the already berthed Orbital ATK Cygnus OA-7 supply ship departed the station on Sunday, June 4 after ground controllers detached it and maneuvered it into position for departure. The commercial Dragon cargo freighter carrying nearly 3 tons of science and supplies for the multinational crew on the CRS-11 resupply mission reached the space stations vicinity Monday morning, June 5, after a two day orbital chase starting from the Kennedy Space Center and a flawless series of carefully choreographed thruster firings culminated in rendezvous. Liftoff of the SpaceX Falcon 9 rocket carrying the unmanned Dragon cargo freighter from seaside Launch Complex 39A at KSC in Florida took place during an instantaneous launch window at 5:07 p.m. EDT Saturday, June 3, following a 48 hour delay due to a stormy weather scrub at the Florida Space Coast on Thursday, June 1. The stunning Falcon 9 launch and landing events were captured by journalists and tourists gathered from around the globe to witness history in the making with their own eyeballs. Check out the expanding gallery of eyepopping photos and videos from several space journalist colleagues and friends and myself – for views you won’t see elsewhere. By 8:30 a.m. Monday morning ground controllers had maneuvered Dragon to within 250 meters of the station and the imaginary keep out sphere around the orbiting complex. Engineers carefully assessed the health of the Dragon and its systems to insure its ability to slowly and safely move in closer for capture by the crew. When Dragon reached a distance of 11 meters, it was grappled by Expedition 52 astronauts Peggy Whitson and Jack Fischer using the 57.7 foot long (17.6 meter long) Canadian-built robotic arm Monday morning at 9:52 a.m. EDT, a few minutes ahead of schedule. “Capture complete,” radioed Whitson as Dragon was captured at its grapple pin by the grappling snares at the terminus of the Canadarm2 robotic arm. Dragon’s capture took place as the ISS was orbiting 250 miles over the South Atlantic Ocean as it was nearing the East coast of Argentina. “Complete complete. Go for capture configuration,” replied Houston Mission control. “We want to thank the entire team on the ground that made this possible, both in Hawthorne and in Houston. Really around the whole world, from support in Canada for this wonderful robotic arm, Kennedy Space Center’s launch support, to countless organizations which prepared the experiments and cargo,” Fischer radioed in response. “It’s also the first second mission to the ISS which was previously here as CRS-4. The last returned visitor was space shuttle Atlantis on the STS-135 mission,” Fischer said. A little over two hours after it was captured by Expedition 52 Flight Engineers Jack Fischer and Peggy Whitson, ground teams maneuvered the unpiloted SpaceX Dragon cargo craft for attachment to the Earth-facing port of the station’s Harmony module. “Ground controllers at Mission Control, Houston reported that Dragon was bolted into place at 12:07 p.m. EDT as the station flew 258 statute miles over central Kazakhstan,” NASA reported. The berthing of Dragon to Harmony was not broadcast live on NASA TV. 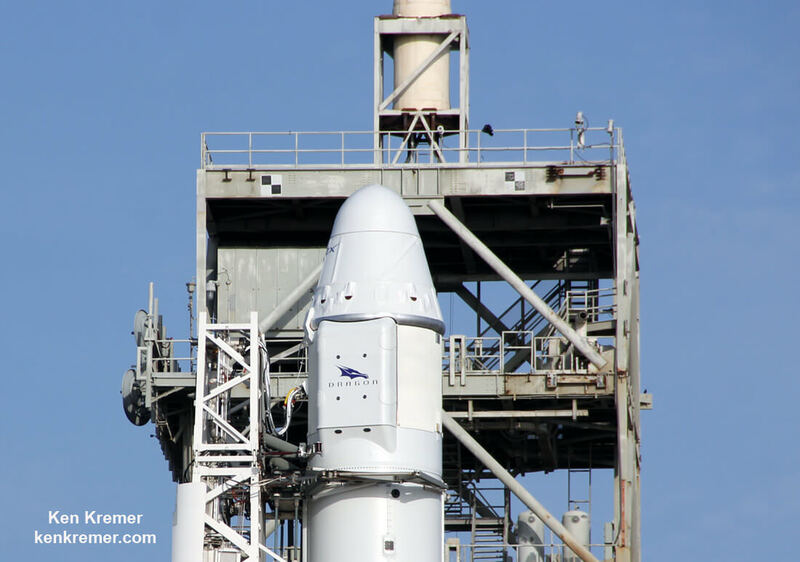 Dragon CRS-11 marks SpaceX’s eleventh contracted commercial resupply services (CRS) mission to the International Space Station for NASA since 2012. Check out these exquisite videos from a wide variety of vantage points including remote cameras at the pad and Cape Canaveral media viewing site – including an A/V compilation of sonic booms from the propulsive ground landing. The gumdrop shaped 20-foot high, 12-foot-diameter Dragon is carrying almost 5,970 pounds of science experiments and research instruments, crew supplies, food water, clothing, hardware, gear and spare parts to the million pound orbiting laboratory complex. The CRS-11 cargo ship will support over 62 of the 250 active research investigations and experiments being conducted by Expedition 52 and 53 crew members. The flight delivered investigations and facilities that study neutron stars, osteoporosis, solar panels, tools for Earth-observation, and more. 40 new micestonauts are also aboard inside the rodent research habitat for a first of its kind osteoporosis science study – that seeks to stem the loss of bone density afflicting millions of people on Earth and astronauts crews in space by testing an experimental drug called NELL-1. The therapy will also examine whether bone can be regenerated for the first time. No drug exists for bone regeneration. The unpressurized trunk of the Dragon spacecraft also transported 3 payloads for science and technology experiments and demonstrations. The truck payloads include the Roll-Out Solar Array (ROSA) solar panels, the Multiple User System for Earth Sensing (MUSES) facility which hosts Earth-viewing instruments and tools for Earth-observation and equipment to study neutron stars with the Neutron Star Interior Composition Explorer (NICER) payload. NICER is the first ever space mission to study the rapidly spinning neutron stars – the densest objects in the universe. The launch coincidentally comes nearly 50 years after they were discovered by British astrophysicist Jocelyn Bell. A second objective of NICER involves the first space test attempting to use pulsars as navigation beacons through technology called Station Explorer for X-Ray Timing and Navigation (SEXTANT). NASA decided to use the SpaceX weather related launch delay to move up the departure of the “SS John Glenn” Cygnus cargo ship by over a month since it was already fully loaded and had completed its mission to deliver approximately 7,600 pounds of supplies and science experiments to the orbiting laboratory and its Expedition 51 and 52 crew members for Orbital ATK’s seventh NASA-contracted commercial resupply mission called OA-7. Named after legendary Mercury and shuttle astronaut John Glenn – 1st American to orbit the Earth – the supply ship had spent 44 days at the station. The “SS John Glenn” will now remain in orbit a week to conduct the third SAFFIRE fire experiment as well as deploy four small Nanoracks satellites before Orbital ATK flight controllers send commands June 11 to deorbit the spacecraft for its destructive reentry into the Earth’s atmosphere over the Pacific Ocean. Watch for Ken’s onsite CRS-11 mission reports direct from the Kennedy Space Center and Cape Canaveral Air Force Station, Florida.